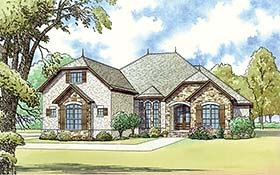 Beautiful stone and brick are complimented by wood shutters and finials in this stunning house plan. The Foyer flows into the Dining Room and Grand Hall. The open floor plan allows laughter and conversation to flow from the Great Room into the Kitchen and connected Breakfast Room. The large Kitchen Island give you plenty of counter space and a 5 person eat at bar. The split bedroom design allows for privacy in the spacious Master Suite located on the left side of the home. Here you'll also find the Laundry room, side load Garage and access to the Bonus Room above. On the other side of house are the other 2 Bedrooms with a Jack and Jill Bathroom.